Date Night returns from a travel hiatus. Did you miss us? Tonight, we visit a recent newcomer to the East Cobb eating scene, which takes the place of an institution. First Houck’s was here for what seems like forever, then The Paper Mill Grill was in this space for years, but we think they had a tax problem (as in they didn’t pay theirs), and they closed a while back. 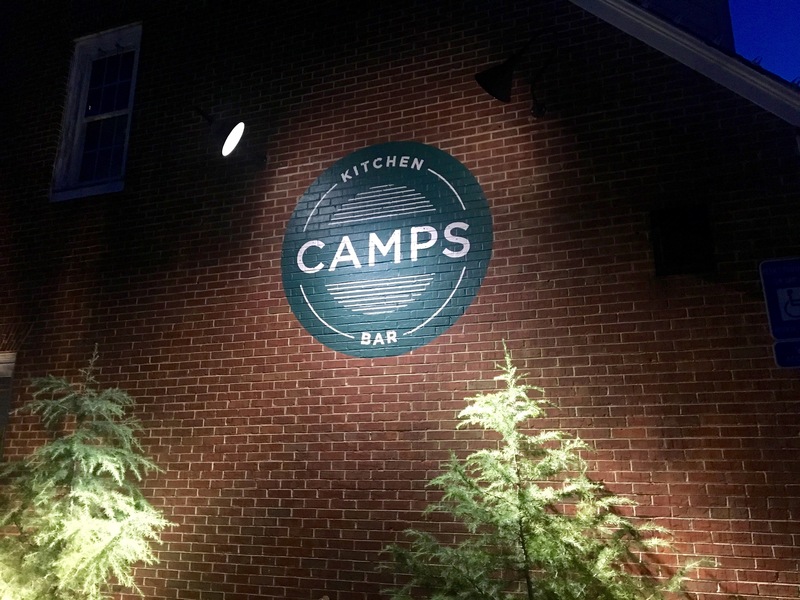 Enter Camps, which is owned by the same folks who run the Hearth Pizza Tavern in Sandy Springs. There’s lots of wood and stone in the decor. 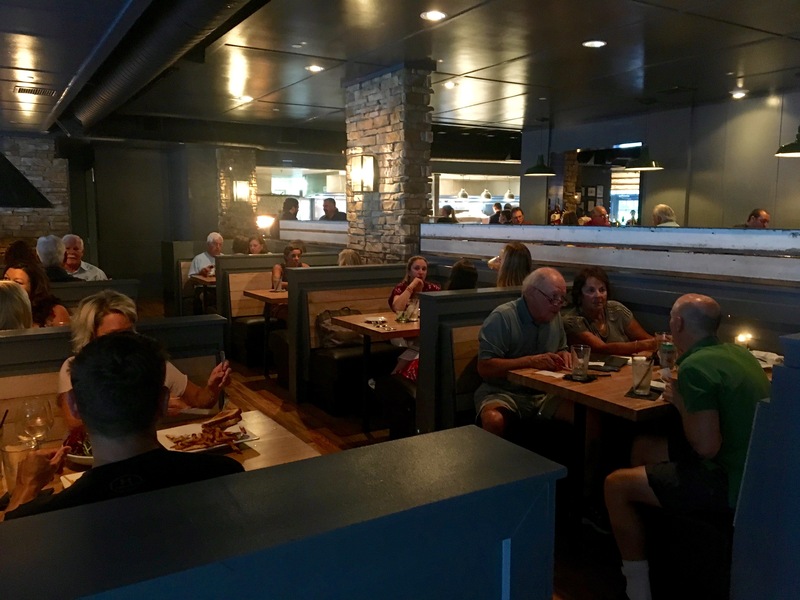 You are greeted by a large bar, where the beautiful people like to sit before they have their dinner. The bar is quite crowded during our date. 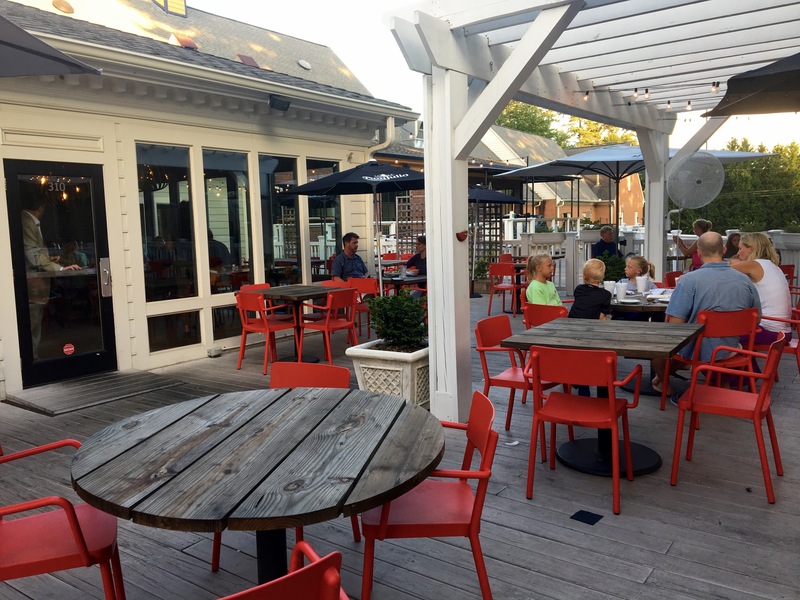 You can sit outdoors if you wish, but it’s too hot for that tonight. 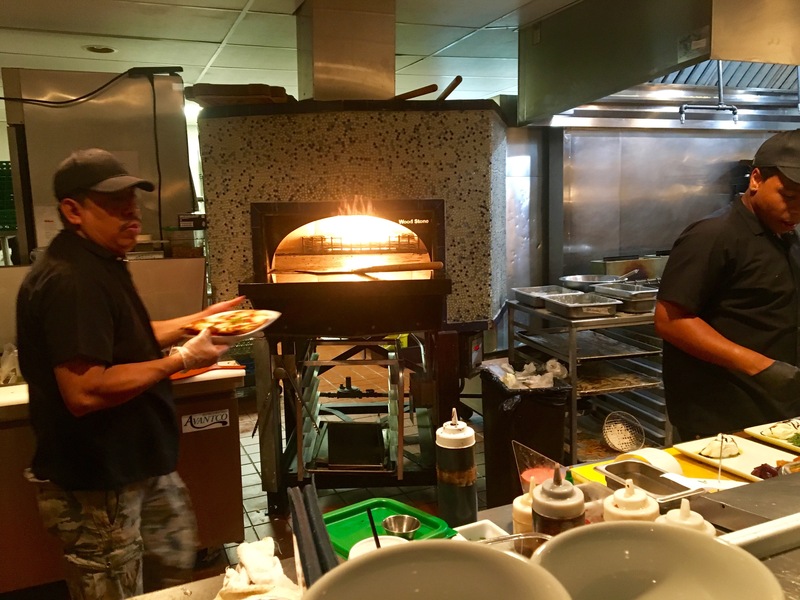 As you walk by the kitchen, it’s hard to miss the wood-fired oven. As we shall see, some good things come out of here. We are joined tonight by Bill and Stephanie, who we dine with about once a month in our version of the “East Cobb Supper Club”, so you will see more food than the both of us can eat. Let’s get things started with some beers. 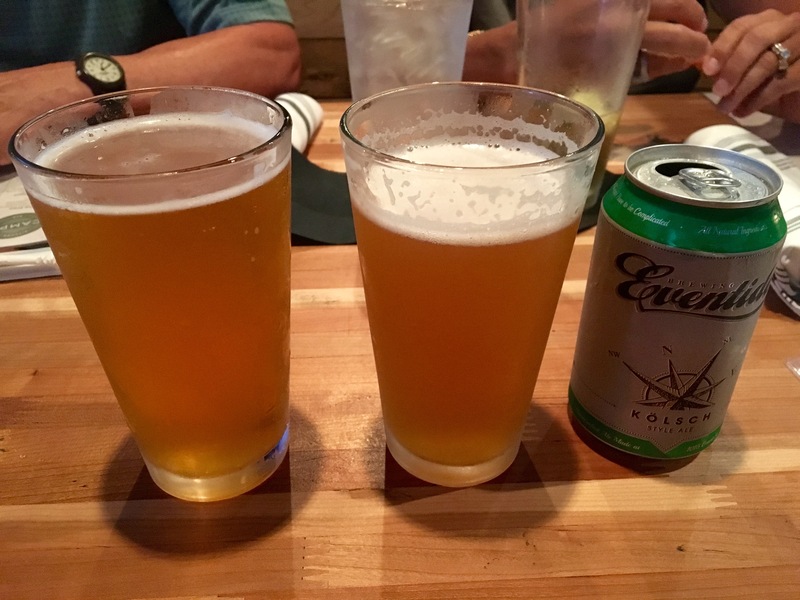 It’s sizzling hot, so why not pop open an Eventide Kolsch (on the right) and a Scattered Sun wheat beer? They are nice and refreshing on a scorching day. Does anybody like cauliflower? I am not a big fan, but when it comes out like this, I could eat a ton of it. 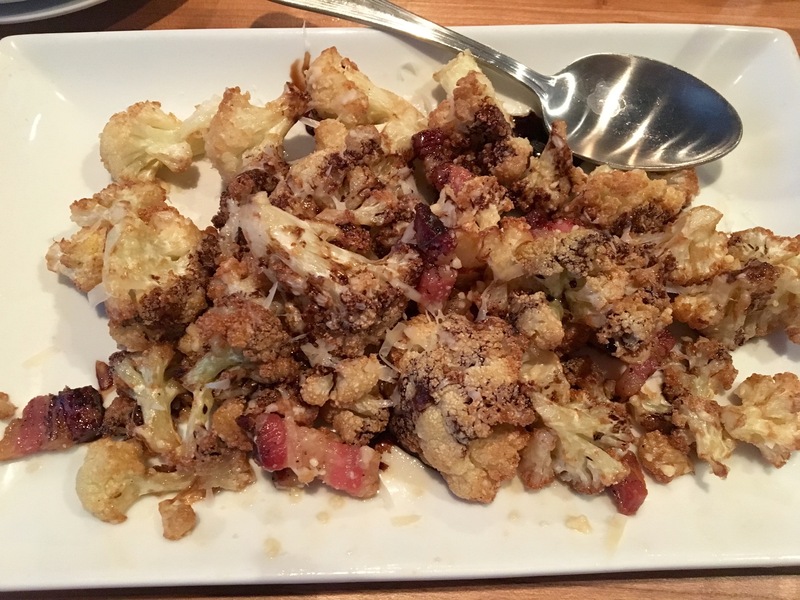 It must be the crispy chunks of pancetta that are roasted with the cauliflower. This is an excellent appetizer and should definitely be ordered. 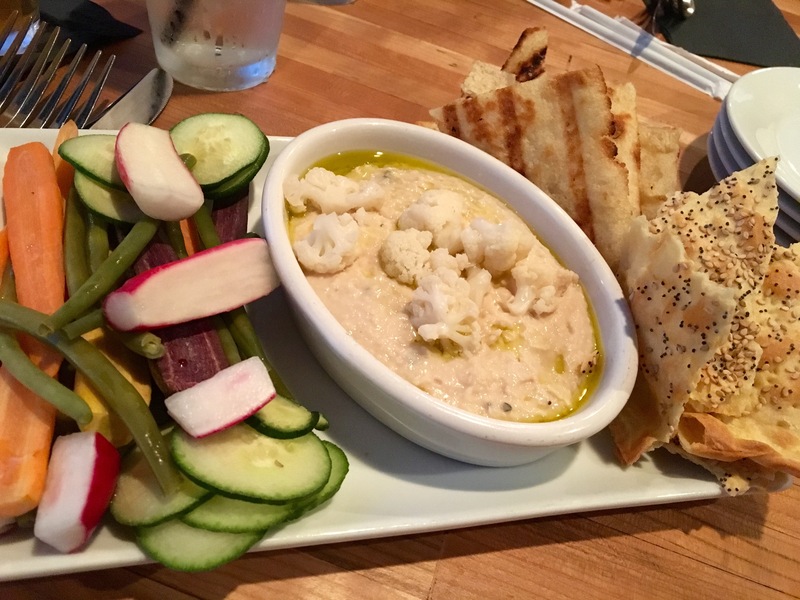 We also get try the white bean hummus. The veggies are pickled, so pucker up. You can eat as healthy as you want at Camps. Our table hits all ends of the spectrum. Stephanie has the best willpower and orders a salad. 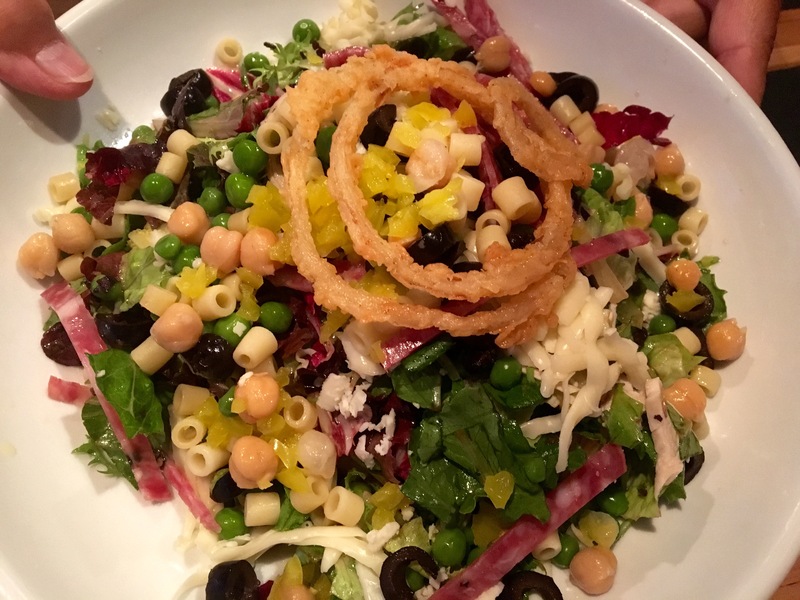 The chopped salad is not only photogenic, it’s full of good things like roasted chicken, salami, dittalini pasta, and garbanzo beans to name a few. Top it all with a vinaigrette dressing and you have a pretty dish. Bill is a burger guy, and he enjoys the Signature Burger. 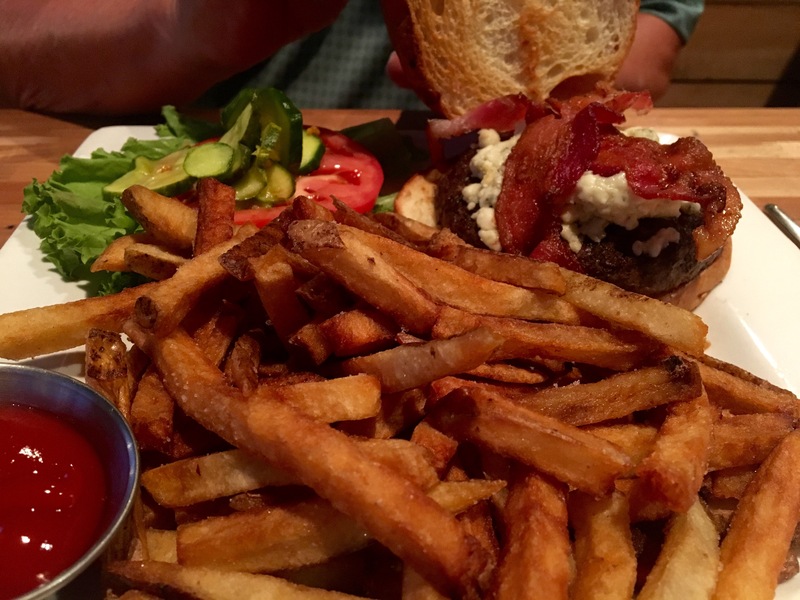 OK, so it looks like a giant plate of French fries, but behind the heaping wall of potato is a burger topped with bacon and bleu cheese on a sesame bun. Bill is not disappointed with his choice. 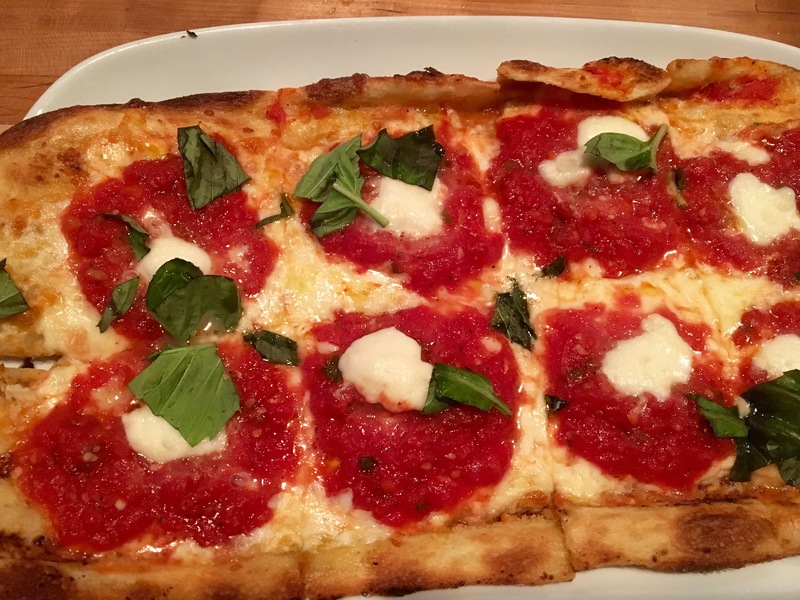 My date orders a Margherita “Pizzetta”. It’s just tomato sauce, basil and a some mozzarella cheese balls, but it does come out of that nice oven. She likes the crust a lot, and remarks that the sauce is more like crushed tomatoes, not a marinara sauce. This allows you to get tomato goodness in every bite. Check out these short ribs. They are served on a bed of mashed cauliflower. Cauliflower twice in one meal. Looks like I have hit my annual intake limit of that vegetable. Actually, this is a very enjoyable dish. 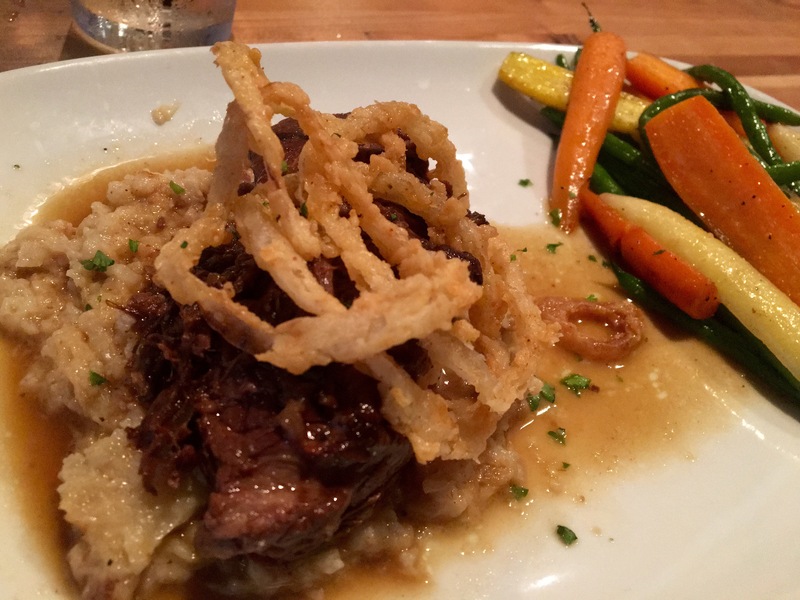 There is a ton of short rib, which filled this reporter’s stomach easily. Get this one if you are hungry. The bottom line on Camp’s: Even though they are one of the new kids on the block, Camps already looks like it’s got some regulars. 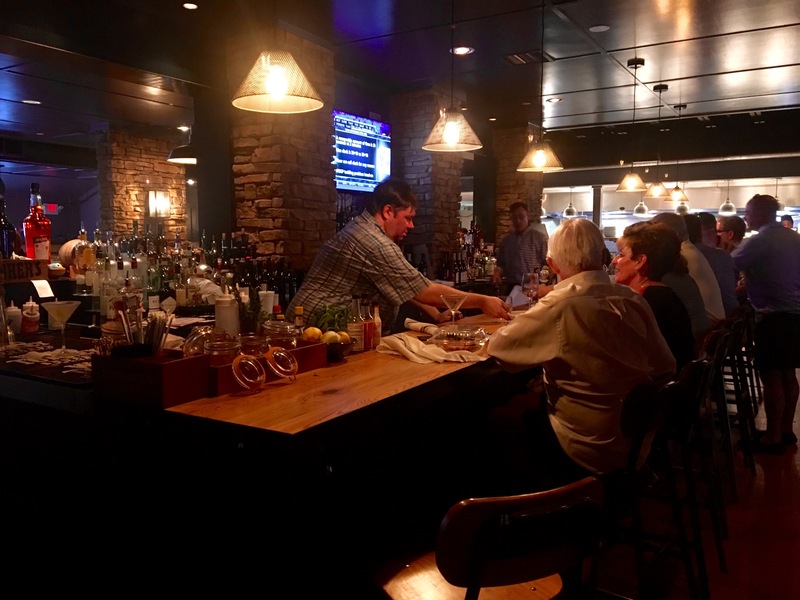 The food is good and the service is friendly, which is a winning formula in this neighborhood. 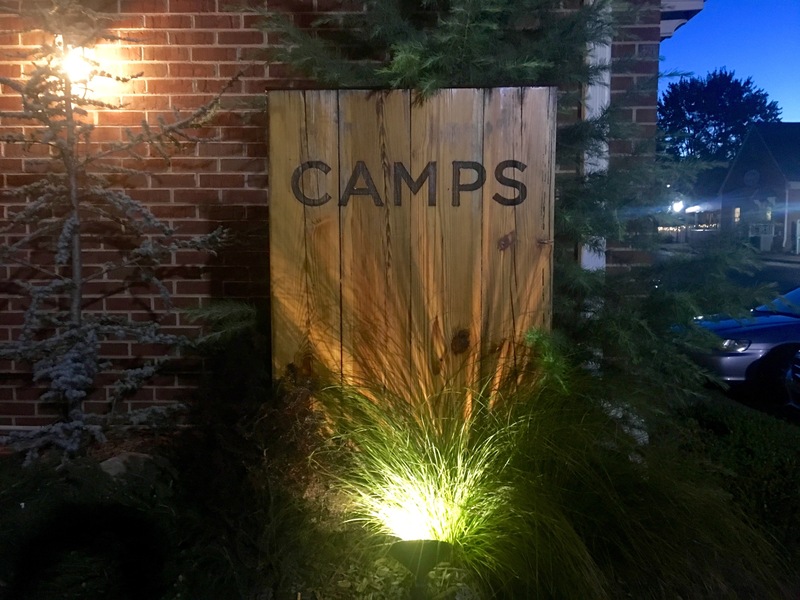 If you live in East Cobb, Camps is worth checking out.